Built in 1500, this elegant historical hotel now offers 56 guest rooms with a view, wide halls, a lounge bar and Internet access. The air-conditioned city hotel also offers a lobby with 24-hour reception and check-out services, as well as a cafe and breakfast room. 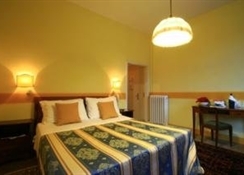 This family-friendly historical hotel is located in a very central and quiet area, 100 m from the famous La Salute Church and 200 m from St Mark's Square. Guests will find restaurants and the bus station within the immediate vicinity of the city hotel and Santa Lucia train station is around 1 km away. The nearest beach is 2 km from the hotel. 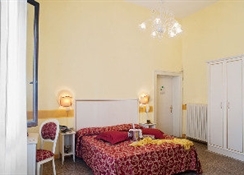 Marco Polo Airport is roughly 5 km away and it is approximately 30 km to St. Angelo Airport. CLASSIC room The rooms with private bathroom are of various sizes, furnished in accordance with the classic Venetian tradition. 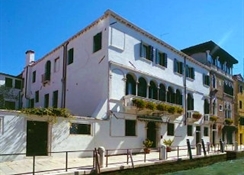 Famous painters and poets, among them Ezra Pound, have stayed for long periods; the rooms offer views of the Canal, internal garden and the splendid Basilica della Salute. ECONOMY Rooms The Economy bedrooms face onto the garden, onto the splendid Basilica della Salute and to the inside of the 1500s Palace. The furnishings are typically Venetian; as required by the tradition uniting antiquity and the experience of craftsmen that over the years created the Venetian Palaces. The washbasin is in the bedroom, while the bathroom is shared on the same floor.